First things first – the DS 5 is no longer a Citroen. PSA – the parent company of both Citroen and Peugeot – has decided to launch a new, luxury sub-brand, which means every DS model will lose its Citroen branding, including the popular DS 3. It makes sense to start with flagship DS model though, so here is the new DS 5. It’s not just a case of changing some stickers though – the car has been given a styling overhaul with a new grille and redesigned headlights. There are revisions to the interior, along with a new, cleaner and more economical range of engines. Citroen (sorry, DS) has also added an improved infotainment system and various upmarket extras like posher leather. The engine range consists of a 1.6-litre petrol engine and a diesel hybrid, along with three BlueHDi diesel engines – a 1.6-litre with 120PS and a 2.0-litre with either 150PS or 180PS. The diesels are expected to make up the majority of sales, with the 150PS the most popular of the three – so that’s what we spent the most time with. Not only is it cleaner than the outgoing 160PS diesel - with emissions down 23g/km to an impressive 105g/km and economy up to 68.9mpg – but it also produces more torque. 370Nm is available at 2000rpm, so accelerating and overtaking are easy. It’s a quiet engine, too, particularly at motorway cruising speeds, with little noise making its way into the cabin from the engine or the outside world. The improved refinement is partly down to some much-needed suspension revisions, with tweaked dampers offering a more compliant ride over bumps than before. The changes are welcome, but while the DS5 is good, it could still have better ride quality over undulating and broken road surfaces. Here things get a little fidgety. The suspension also thumps and thuds over potholes noticeably. There’s no denying the improvements in corners though, where the extra compliance isn’t at the expense of body roll. The DS 5 is neat and precise through bends, though the car does feel heavy - it might be capable but you won’t relish the drive like you would in a DS3. The DS5 is really at its best on a long trip, where the ample torque, smooth gearbox and quiet cabin make things relaxed and effortless. Things are even more tranquil if you opt for an automatic transmission, though you’ll need to pick a different engine to get one. We tried the 180PS BlueHDi with the EAT6 automatic and found it very smooth indeed when shifting up or down, yet responsive enough to take on slow-moving traffic or to pick up speed on a slip-road. One of the most unique features of the DS 5 has always been the aircraft inspired cabin, which only gets light tweaks. It retains its overhead switches, optional head-up display and sculpted centre console, but is now available with some new styling extras including plusher ‘semi-aniline’ leather. There is also a clearer and more intuitive infotainment system with navigation as standard. The interior is from perfect, however. Rearward visibility is poor due to a spoiler mounted exactly where you need to see, while rear legroom is tight for a car in this class. The storage cubbies are small and awkward to use too. Adults will struggle to get comfortable in the back unless the front seat occupants are fairly small and while boot size is adequate at 450 litres, in comparison a Skoda Superb offers more than 600 litres of capacity. A Skoda Superb costs less too. The DS 5 starts at a not inexpensive £25,980, though that does get you a generous level of standard equipment. Entry-level Elegance cars get keyless entry and start, a three-part panoramic roof, touchscreen infotainment, Bluetooth, navigation and DAB radio. Moving up to Prestige trim adds extras including leather and LED headlights. Obviously opting for the top-trim level cranks up the price, as do optional extras like the beautiful watch-strap style leather seats. 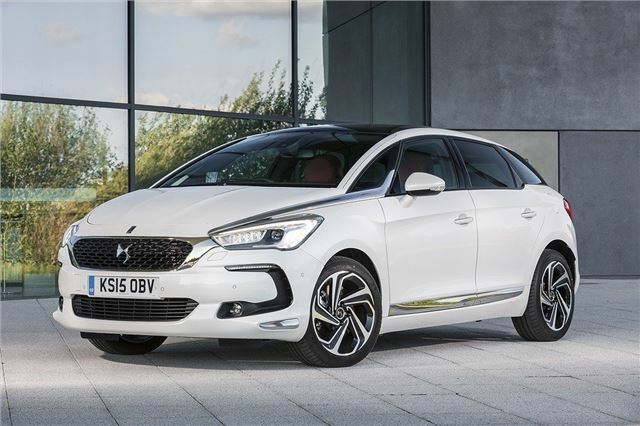 In fact it is very easy to push the DS 5 list price past £30,000, which is in the same territory as arguably more prestigious models like the Mercedes-Benz CLA Shooting Brake. There are also cheaper options to consider, like the impressive new Volkswagen Passat. But, to use a cliché, the DS 5 does have some French ‘je ne sais quoi’ about it. The bold looks and unique interior come allied to much improved suspension while more economical engines mean lower running costs. So, if you’ve always fancied the DS 5, the tweaks mean there is more reason than ever to buy one. The new DS 5 is available from July 1.